This Christmas is about to go off with a bang! Things can’t possibly get worse for Tabby. Framed for a crime she didn’t commit, she suddenly finds herself without a job. Then to make matters worse, Tabby’s boyfriend dumps her and gives her cat away to a shelter. But rescue comes in the form of kindly Mercy. A master of saving waifs and strays, Mercy wants Tabby to breathe new flair into her ailing cracker business. Together, they’ll save Marwood’s Magical Christmas Crackers. But someone has other ideas. Mercy’s nephew Randal thinks Tabby’s a fraudster. Stubborn, difficult and very attractive, her future depends upon winning him round. But it’s that time of the year when miracles really can happen. 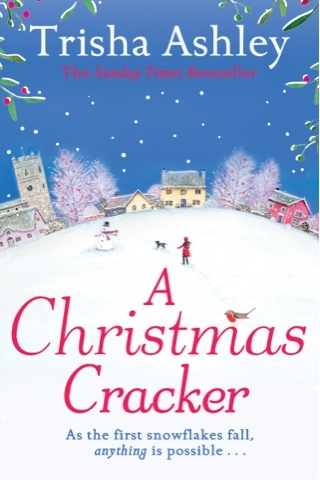 Standing under the mistletoe, Tabby’s Christmas is set to be one that she will never forget . . . When I heard that a new Christmas story from Trisha Ashley was on its way, I was itching to get my hands on it. This is my favourite time of the year, when there are so many festive books out there, but this one went to the top of the pile as soon as it arrived. It is indeed a cracking tale (forgive the pun), as I would have expected. As soon as I sat down to read it, I didn't want to put it down. Right from the first sentence of the first chapter it has you hooked. I also loved the fact that each chapter started with a Cracker joke! There is a host of interesting characters in this book; even the pets are unusual. The heroine, Tabby, is framed for a crime she didn't commit and ends up jobless, homeless and with an ex-fiancé. Luckily, she meets up with people who believe in her innocence, offer her a job and a home, and that's how she ends up trying to revive the fortunes of an ailing Christmas cracker factory. I instantly felt sorry for Tabby, but I needn't have worried since she has great strength of character and manages to maintain a positive outlook in the face of all her problems. I liked almost all of the characters in the book, with the possible exception of Tabby's ex-fiancé, Jeremy, and his friends. The owner of the cracker factory, Mercy, is an amazing person, who seems to display the true spirit of Christmas all year round. Then there is the workforce from the factory - all of them have interesting backgrounds. Mercy's nephew, Randal, is openly hostile to Tabby from the start, but I found myself liking him too, more so as the story progressed. It was nice to meet up with some familiar characters and place names from a few of Trisha's earlier books as well. You always encounter a few people that you know when you read one of her stories, just like bumping into old friends. She comes up with such interesting names for both people and villages too. I would say that this book is well written with a strong story line that grabs you from the word go. I'm sure that I don't need to recommend it to Trisha Ashley fans, who will be setting out to read it as soon as possible anyway, but to anyone unfamiliar with this author it would make great Christmas reading!